Days before Corey is to return home to the snow and ice of Lost Creek, Alaska, to visit her best friend, Kyra dies. Corey is devastated―and confused. The entire Lost community speaks in hushed tones about the town's lost daughter, saying her death was meant to be. And they push Corey away like she's a stranger. Friendship: The friendship is woven around every fiber of this book. There are way too many YA books where insta loves makes two good friends lovers, or where insta love makes two good friends hate each other. I love how friendship is the core for this book and that that's what the focus is on. Life lessons: There is a great deal to learn from this book. I loved how Kyra looks at the world and questions everything around her. This book contains friendship, loss, doubts, heartbreak, fear, mental illness and the way a small town can break a person. All subjects that this author is not afraid to use in her book and make sure you learn something from it. Portraying Mental Illness: Mental Health is something that's very hard to grab, for me personally. I've written this before; It's so hard to understand and even harder to watch and not be able to do something about it. I felt like I could understand Corey, while she had to watch Kyra crumble and crawl back up. This book is not trying to give you an explanation or a way to deal with mental healt, it just shows how raw it can be and how helpless you can feel while you fiercely love this person. No tension: While the book was creepy, there never was a lot of tension for me. The book lingers on a bit, has a tensive little part at the end, but not much before that scene. While you do question what happened and there is a lot of Mystery, it lacked a bit of tension. Not very believable: I found the way Kyra's parents react to her death very unbelievable, as well as the way Kyra died and what happened to her before that. The characters and the feelings in this book were so real, while the plot was a bit unbelievable. So sad.. I have to be honest here, I did not like This Is Where It Ends that much. I felt that Marieke Nijkamp did not give me enough answers at the end of the book, while the characters and relationships were the best part of the book. I was so happy to see I was chosen to review the book via Netgalley because I did not feel that Marieke Nijkamp is a bad author. I feel that she gave me a satisfactory feeling and the end of the book and was able to write another book with great characters and a lot of feelings and life lessons. 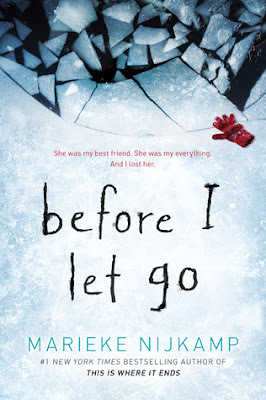 So while I try not to compare books, I do have to tell you that I like Before I Let Go better than her first book! "With exceptional handling of everything from mental illness to guilt and a riveting, magic realist narrative, this well wrought, haunting novel will stick with readers long after the final page." "Love me or hate me if you want, I don't care. But do it for all that I am, with all that I am." Did you read This Is Where It Ends? Are you excited for this book?